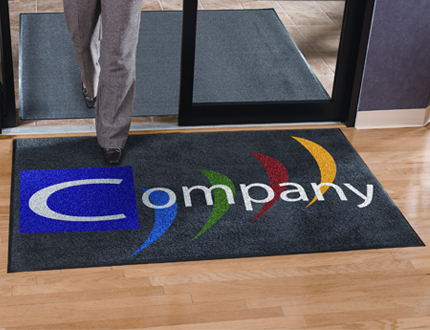 Mats used to be commonly associated with creating an appealing and attractive welcome to one’s home or a workplace. But is there any real effectiveness to them except pure esthetics? However, taking care of what is under our feet has become more important than before. The reason for that lies in changes of perspectives. Today, environmentally-friendly products and procedures have almost become a requirement. Also, health and safety at work have significantly improved, as well as care for working conditions of employees. This is why cutting-edge Evolution Mats produced by Alsco are the last word in mat production. Made from recycled materials, they help in controlling dust and dirt, but also prevent trip hazards and fatigue in employees. Stop dirt right at your door and prevent it from spreading by using entrance mats. Since 70% of all the dust and dirt is brought in by foot, no wonder then why entrance mats are a necessity in creating a cleaner workplace. If you still use textile floor mats, you should know that they are an ideal bacteria breeding ground. People pick them up as they walk over fibers and spread them further. Research has shown that as many 5,000 bacteria exist in each square inch of footwear. But anti-microbial mats are the right solution to this problem. The development of anti-microbial mats means that this no longer is a problem. Antimicrobial additives used on mats prevent the growth of bacteria and fungi in order to provide a healthier and cleaner work environment. Alsco Evolution Mats are made from recycled and re-engineered materials. This means that no raw materials are used in the production process. In addition to all the advantages of recycling rubber, plastics and other fibers, less water and energy are used in the production of Evolution Mats. When it comes to taking care of your staff’s health, anti-fatigue mats are the perfect solution to preventing negative impacts of standing for extended periods. They are safe, comfortable, and highly resistant. Pressure-absorbent rubber and other materials with similar effects, as well as thicker piles with cushioned bases, help ease the problem. Various studies have shown that these mats lead to reduced absenteeism and injuries, and increased employee satisfaction and productivity. Safety of your employees’ matters. If you aim to create a safe environment for your workers, then floor mats would be your most logical choice. Adding mats to any place where employees work with water, oil, or there are slippery floors, is crucial to preventing injuries. Made from specialised, waterproof rubber, these mats are not only resistant to water, but also to other liquids, such as oils and solvents. Today’s mats are also ripple free and have bevelled edges, for bringing the safety aspect to the next level. As they come textured for grip and safety, they are great for all workplaces with heavy traffic. Tripping over a mat is practically impossible. But that’s not all. In highly competitive markets, opting for products and companies that make a difference has become a matter of doing the right thing. Using recycling instead of raw materials, by using Evolution Mats you contribute to reducing carbon emissions and protecting the environment. Make sure your office is clean and well-maintained as it leaves a good impression on both employees and customers. Start with simple yet efficient steps of creating a safe workplace by installing our Work & Dust Control Mats, Anti-Fatigue & Wet Area Mats, Message & Safety Mats, Welcome Mats, Corporate & Logo Mats, or Entrance Mats. They are all made from recycled and eco-friendly materials. Call Alsco now and we will be more than happy to help you achieve these goals.